The Courtyard Calgary South welcomes you with impeccably appointed hotel accommodation, superb amenities and a prime location. You'll find our hotel in the heart of the city's lively Seton Urban District; Macleod Trail, TELUS Spark Science Centre and Spruce Meadows are all just a short distance away. Unwind in your spacious room or suite, which features free Wi-Fi access, plush bedding and a well-lit workspace. Join us for breakfast or dinner at The Bistro, or challenge yourself to a workout in the hotel gym. We also offer an indoor pool and even a waterslide. Indulge in a day of relaxation during your stay in South Calgary, Alberta; our hotel showcases a tranquil on-site spa with the city's only Turkish hammam. Or plan an event in our light-infused meeting room, which can seat nearly 100 people. And be sure to spend time exploring Calgary; from dining in the Seton Urban District to shopping at Chinook Centre, there is plenty to do here. 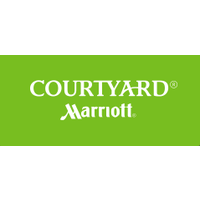 We look forward to your stay at the Courtyard Calgary South! Large open lobby with elevated ceilings and contemporary decor.